Tendon and ligaments are dense connective tissues.The tendon cells are modified fibroblasts. Tendons occur at the ends of skeletal muscles, and serves to attach them strongly to bones. Ligaments are found in joints. 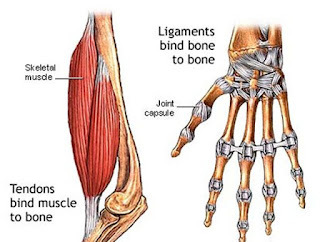 Ligaments connect bones at joints and hold them together in position. The matrix is densely crowded with collagen fibres running in different directions and with some elastin fibres inbetween. Some flat elongated ligament cells are seen inbetween the fibres. Tendon joins skeletal muscle to a bone. Ligaments join a bone to another bone. It is tough and inelastic. It is strong but elastic. It is a modification of yellow elastic tissue with some collagen fibres. Fibroblasts lie in a almost continuous rows. Fibres are seen as dense parallel bundles. Fibres are densely crowded but not arranged in parallel bundles. I did not know before this. Thank you for share this good informations. This will surely help in my exam. this site was a big help for me in my homework.